Teachers often feel the need to be reassured about the use of the mother tongue in class and that probably happens because, in the past, they’ve been advised – or perhaps instructed – to steer clear of L1 in their lessons. When addressing the issue, I usually begin by stating the obvious: students need to hear as much English in class as they possibly can. The teacher’s English is still an important source of comprehensible input – never mind youtube, cable and ipods. 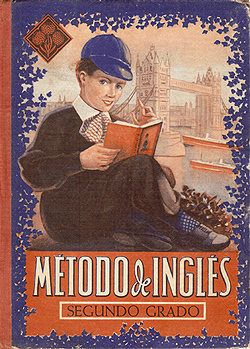 Students of all levels and ages need a substantial amount of exposure to English in class and that can’t be disputed. If using L1 class means depriving students of precious minutes during which they could be listening to i+1 (=raw material for acquisition), then there are convincing grounds for restricting the use of L1 in class. However, conducting (part of) the lesson in the students’ mother tongue is one thing, using L1 to convey/clarify meaning and contrast the two languages, quite another – at least as far as the exposure trade-off is concerned. And yet, it’s precisely this “pedagogical” use of the mother tongue in class that mainstream ELT still seems to have mixed feelings about. True, over the past two decades, few teachers, teacher educators and policy makers would go so far as to dismiss the use of L1 out of hand. Instead, the current orthodoxy seems to advocate the “judicious” use of the mother tongue when strictly necessary, on a last resort basis. In other words, if you really need to use L1, fine. If you don’t, so much the better. Why is the use of the mother tongue (for clarification and contrast) something to be done with caution rather than wholehearted belief? Nobody seems to have the answer to this question (though, Scott, I will definitely be checking that book). What I have heard, over and over, is that using L1 for clarification and contrast might encourage students to “think in L1” and this, in turn, might get in the way of interlanguage development. In all honesty, I have never really bought this argument for two reasons. One, “think about a language” is not synonymous with “think in a language.” Two, even if it was, how do we know that people do actually think in English, Portuguese, Russian or whatever? What if we think in an abstract “language of thought” (“mentalese”)? In my lessons, whenever I make deliberate (rather than last-resort) use of L1 to convey meaning or contrast languages, I still hear a little voice inside my head telling me that maybe I shouldn’t. But this voice had better come up with a plausible set of reasons why not or else I will continue trying to ignore it. And the very best of luck with your book proposal. 1. The fact that TEFL courses in the UK are normally made up of students with a wide variety of L1s. 2. The fact that if you are going to use translation effectively in the teaching of, say, lexical chunks (where it works superbly), or to contrast L2 and L1 grammar, you really do have to know the L1 of the students very well indeed. Few teachers get to this level. I agree with Glennie about ESOL classrooms in the UK needing to take into consideration that a teacher cannot know all the different L1s in the classroom and so it would be unfair to help the Spanish student in L1 and not be able to give similar treatment to, say, a Chinese student. My TEFL course taught me to stay away from L1 but being in Spain, now, I don’t know. Sometimes I do “help” a little in L1, but I’m not comfortable with it. Scott, do you believe this TILT/GT approach should be used strictly for a monolingual classroom? …do you believe this TILT/GT approach should be used strictly for a monolingual classroom? Obviously the use of the students’ mother tongue poses a different set of issues in the multi-lingual classroom, but I don’t think it is totally excluded – see for example philb81’s post below, where the product (a translated poem) is less important than the process of translating it. Other activities include text reconstruction, where learners individually (or in small groups where there is a common mother tongue) translate a short English text into their L1, and then translate it back into English again (the original text being of course concealed), and then compare it with the original. Allowing students to brainstorm a lexical set using their bilingual dictionaries is another activity that doesn’t require the teacher to speak their L1. Glennie, I think that the two factors you mention are terribly important, but there are two things I’d like to add to them. 1. It is true that UK-based English language courses tend to be multilingual, but this is an anomaly in the world of language teaching. The vast majority of teachers in the world teach in monolingual settings. It seems a real shame that their practices should be influenced by an educational philosophy that evolved for a setting so different from their own. 2. I’m not sure if it is true that few UK teachers get to know the L1 of their students really well. However, most English teachers, globally, have a very high level of the target language (English) … and, of course, they have the same ‘own language’ as their students. TEFL courses really have wielded a disproportionate influence on the world of English language teaching! Yes, not least because of the pervasive influence of pre-service training courses like the CELTA, and their strictly monolingual methodology. I’m not sure if this is still the case, but on many CELTA courses (and their antecedents, the RSA etc) monolingualism was established on Day 1, using a clever little bit of theatre called ‘the foreign language lesson’, whereby the unsuspecting trainees are ‘converted’ to the Direct Method in just 30 or 40 minutes. I still remember the Thai lesson on my ‘4-week course’ 35 years ago, and how amazed I was by the fact that we were all speaking Thai within minutes without a single word of English having been used. Magic! I was immediately born again as a devoted follower of the DM. (As a side effect I, of course, learnt no Arabic either – which served only to entrench the culture of native-speakerism). Thanks for the thoughtful comment, Luiz. With regard to your question, “Why is the use of the mother tongue (for clarification and contrast) something to be done with caution rather than wholehearted belief?” one reason is the residual distrust – popularised by stories of mistranslations and the unwitting use of ‘false friends’ – that every language is a system unto itself, and any attempt to explain one in terms of another is a slippery slope. It’s the same prejudice that proscribes the use of bilingual dictionaries. It is a view that gained a lot of currency due to the influence of behaviorist learning theories, which argued that the habits of the mother tongue should not be allowed to influence the habits of the target language – since these influences are almost always negative. This attitude persists as a kind of folk theory of language acquisition, despite the fact that behaviorist learning theory has been largely (but not completely) discredited. And even in the post-behaviorist, Chomskyan era, the view has prevailed that – since each language is a different configuration of the innate principles of Universal Grammar – it’s probably best to reconfigure any additional language ‘from scratch’, without recourse to exisiting configurations. The fact of the matter is, though, that whether we like it or not, second language learners are constantly comparing and contrasting the two systems, even if their cognitions are not verbalised. Maybe it would help them if this contrastive work was made explicit, and hopefully more efficient, through some kind of peer and teacher intervention. You’re absolutely right, Glennie. This perhaps explains why major publishers aren’t really interested in a coursebook with a stronger translation component to it: it simply wouldn’t sell in multi-lingual contexts. But what about people like me, who operate in a 100% monolingual context? You are a victim of the market Luiz. That’s what happens when private publishing gets too strong a hold in education: needs aren’t met unless the meeting of them is profitable. Long live non-profitmaking publishing for education! I choose to focus on teaching monolingual learners for the course planning assignment for the new third module of the DELTA and came to discover that the only person who tends to be monolingual in the EFL classroom is the teacher – whether by actual lack of linguistic knowledge or by choice. I really started to think about what the term ‘monolingual’ really means. There is hardly a classroom that is ‘monolingual’. The truth is that when we open ourselves to the negotiation of meaning we become bilingual or multilingual even. Interesting line of research, Delpha, and I concur with your conclusion that the monolingual classroom probably does not exist, certainly not at the level of the learners’ (unspoken) cognitions, the point I made above, to Luiz. Thanks for those two references, too. What is the source of the Widdowson one? (I can’t find a reference in any of the Widdowson books I have). The Widdowson piece is an article in a book called New Perspectives and Issues in Educational Language Proficiency. 2001. I think that people who don’t use L1 or translation in the classroom should certainly experiment with doing so. In the same way, people who use a lot of L1 or translation in the classroom should develop the ability to do without it or with minimal use of it – and this is, in my experience and opinion, more important than experimenting with other ways of using those things for most of those teachers. There is always a danger in rehabilitating L1 use that we just give people reasons for continuing to give ALL classroom instructions etc in L1 – still the typical language classroom in the world. In fact, the main practical effect of this effort in the last ten years or so is that most Primary-level textbooks now have instructions for teachers that include “Explain…. in L1”. For many teachers that is impossible, not only if they don’t have mastery in the students’ L1, but also if there is not a shared L1 in the classroom. The latter is increasingly common in Europe, and is starting to get some recognition in books that have a sensible approach to the use of the target language such as Teaching with Bear. In fact, some students in primary school English classes might be more fluent in English than in the language of the country they are studying in. I agree, Alex, that the use of the L1 in class is as prone to abuse as is the refusal to use it. Cook’s argument, and the motivation for writing my GT coursebook proposal, is that the absue of GT doesn’t necessarily invalidate it as an approach – it just needs to be re-thought, and some of its more fossilised features (such as the translation back-and-forth of highly contrived sentences) re-designed. But since TT programs (as far as I know) never deal with GT, nor encourage trainee teachers to experiment with it, it is still languishing in the methodological ‘dark ages’. It occurs to me writing that description that we are actually conflating two totally distinct things- sensible use of L1 by the teacher and sensible use of L1 by the students. Agreed (re research study) Alex. In fact, ANY research into the effects of bilingual instruction would be welcome. 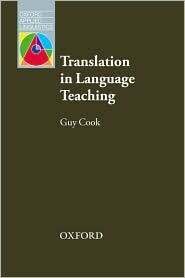 Cook makes the point that “the notion that translation is not helpful to acquisition seems to have become so firmly established that it has hardly been investigated at all” (p. 87-88). An alternative approach might be to integrate the teaching of such skills as mediation, interpreting, code-switiching, borrowing, and, yes, translation, into the communicative model. Interesting point about mediation, Scott. Funnily enough, oral and written mediation figure quite explicitly in the Common European Framework, although this part is often ignored. Oral mediation is broken down into ‘simultaneous, consecutive and informal interpretation’ and written into ‘exact, literary, summarising gist and paraphrasing’ (pp 87-88) A number of mediation strategies are then detailed. The fact that the CEF integrates mediating activities in this way suggests to me an “official recognition” of the kinds of multilingual contexts you were talking about and their prevalence in this globalised world. The quote from Cook only backs this up, as do concepts such as the “successful user” and “partial competence”. With regards translation in coursebooks. I was involved in a project in which we, on occasions, used rubric such as ‘translate this sentence into your language’ when we wanted students to notice a particular structure or chunk and how similar or different it was in the students’ L1. The course was aimed primarily (although not exclusively) at the Spanish-speaking world. When the next edition came out, we were asked to remove all mention of ‘t’ words and change the rubric altogether or paraphrase with something like “how would you say this in your language?” It wasn’t the idea but the ‘t’ word which was obviously considered taboo. It was also removed from the vocabulary reference book that accompanied the student book. When I queried this, I was told students may well translate anyway but that we shouldn’t be encouraging them to do so! As a result, I think you’d be hard pressed to find the word ‘translate’ in any coursebook today, at least used in a regular fashion in rubrics, so despite the CEF and so on, the prejudices clearly persist. Thanks, Ben – for that reminder that ‘plurilingualism’ (in CEF terms) assumes the ability, not only to speak more than one language, but to mediate between them. Do we consciously train learners to do this? I was also fascinated by your account of how the ‘T-word’ was written out of the course you were involved in. For someone like yourself who has written and spoken extensively on taboo language and proscribed topics, it is ironic that the biggest taboo (for your publishers) was translation! I bet Guy Cook would have made a lot of this story in his book! I like the point that Grammar Translation does not have to be inauthentic sentence level (and below) language extracts. I have a background in translation as well as teaching, and current translation theory maintains the importance of seeing texts within their social and cultural context. It strikes me that the use of translation and comparison is a powerful way of investigating cultural differences and how this impacts on language and communicative situations. Aside from this, translation is a useful exercise as it always involves investigating the exact meanings of what is written, along with the intention of the author in writing them. I suspect that the concerns raised above about teachers’ confidence in their learners’ L1 is a barrier, especially in multilingual groups. I did have an interesting coversation with someone (hi Amanda!) yesterday who has asked learners in a multilingual group to translate a poem. Learners had to engage with the English text at a deeper level. . In this case the discussion of the English that ensued from learners exploring meaning was enough, without needing to check their final texts. Translation could be a useful exercise in classes where the teacher doesn’t have access to learners’ L1. For reading on translation and culture, I recommend: David Katan ‘Translating Cultures’ and Christiane Nord ‘Translation as a Purposeful Activity: functionalist approaches explained’. This raises a lot of debate and really starts to look at cultural assumptions. The first issue is the use of different names for the battle and why this might be the case. The next really interesting point is the use of “martyr” in Turkish rather than “soldier.” It certainly shows a huge difference in the cultural perceptions of war and has interesting religious connotations. Also, the “we gave” instead of “soldiers lost” can be mined for collectivist vs. individualist cultural differences. From that one sentence, an entire discussion can develop and translation is the catalyst. This topic has always interested me and was one discussed in #ELTchat on Twitter recently. I teach kids in a primary school and I do not speak in their L1 of Turkish in the classroom. However, I do not in any way restrict the students’ use of L1 amongst themselves. Also, it’s not entirely accurate to say I never use Turkish in class because I do. I just don’t speak it! For example, I will give instructions for an activity entirely in English, eliciting ideas and concept checking as I go, and I will then eavesdrop on the students as they confirm with each other (usually in Turkish) what they are going to do. In most cases, they then continue with the activity. In others, I may hear something that suggests they haven’t fully understood and then intervene to put them back on track. Another example: with unknown words, I try to explain in English but, in cases where this is not easily or effectively done, I rely on other students to provide a translation (again, my knowledge of Turkish, though unvoiced in class, means I know if the translation is accurate or not). I think this kind of peer support and help is valuable in the classroom. I also accept that my situation is different to most, however. I work in a regular school rather than a dedicated language one and I am not the kids’ only English teacher. They also have a Turkish teacher who teaches ‘grammar’. I, as the foriegn or ‘imported’ teacher, am supposed to focus on developing their communicative skills. Getting them to at the very least talk to me in English has been a great way of achieving this. I really liked the difference you pointed out, Dave, between *using* the learners L1 as opposed to speaking it. Good thinking! A very timely post here Scott. I agree with you that the bad rap GT has received is primarily the result of all the baggage it carries with it. GT should be an important element of language classrooms, but due to the field’s current understanding of it, it’s seen as a packaged method. I think that actually would be a useful distinction to make. Grammar Translation refers to the old method that incorporated all the negative elements you mention above. Translation activities, however, could refer to the use of translation in a communicative framework. Use of L1 could be used to describe David’s very sensible approach or other judicious uses of L1 in the classroom. This anti-L1 sentiment is quite strongly ingrained in our field and I still get shocked looks from teachers when I tell them I use it in a variety of ways in the class. I think it’s simply because anti-L1 rhetoric is pounded home so hard on CELTA courses. I have experimented with various uses of translation and L1 in the class. Translation I have found to be extremely useful and productive and is an important skill for many students in its own right. On the other hand, L1 use, especially with lower levels, I’ve found to be quite unproductive. It simply seems to encourage student laziness. Times when I have tried it, students don’t bother to listen in English and wait for a translation from me or a student, fall back on the L1 to ask questions rather than try in English, delay asking questions in class in English to ask them later in L1, etc. This is on top of the traditional problems that students don’t bother to try and think in the L2 and become overly dependent on L1 where they simply can’t wrap their heads around anything that doesn’t exist in their L1. From all this, I’ve learned that a fairly firm L2 environment for lower levels is incredibly beneficial as it gets them to really make the effort to use the target language as much as possible and gets them out of the rut of assuming direct translation works. Most beginning language students are very shocked to learn that different languages have different grammar and that word-for-word translations are often incorrect. I’ll use translation in these classes to support that understanding, but that’s about it. Once that framework is firmly established, usually by pre-int or so, I relax a lot on the almost all L2 policy. We have looked at the dangers of assuming direct translation works and the benefits of practicing the L2 a lot. Thanks Nick (for both your comments). I’m intrigued by this comment: “Students don’t bother to try and think in the L2”. This is a much-used argument in favour of a ‘direct method’, no-L1, model of second language instruction. But what does it really mean? Are the two languages (L1 and L2) ever so separated that one ‘thinks’ exclusively in one and not the other? And would it matter if you didn’t (think in the L2)? After all, do simultaneous translators ‘think in the L2’, or do they move fluidly between the two? And do fluent bilinguals, who code-switch effortlessly when speaking to another fluent bilingual, think in only one language at a time? And/or – is the ability to ‘think in the L2’ (if such a mental state exists) relatively late-acquired (a bit like fluency, i.e. the ability to plan and speak more or less simultaneously), and doesn’t it presuppose a period (possibly even a long one) of conscious mental translation? Some questions for which there are possbily no real answers! A couple of interesting points raised by Nick and Scott here. I have often wondered about the ‘thinking in the target language’ argument. Is thinking a linguistic process? I believe more that we think in, well, thoughts. In other words, flashes of inspiration, ideas, visions that we then articulate into words (if they are worth sharing!). ‘Mentalese’ as Luiz out it in the first comment. The other is a point I often made to my students when working with adult learners: I consider translation from L1 to L2 or vice versa to be a skill quite different from ‘knowing’ the L2. I know plenty of people here in Turkey who speak, write and understand English to an advanced level but struggle when asked to translate something. That involves an advanced understanding of tone, register, appropriacy and (in the case of formal Turkish to English) separating paragraph-long sentences into more manageable ones carrying the same meaning. Good questions Scott and I have often asked myself the same things. I think people do think in the L2. It’s like a process of automatization. Most children on Earth it seems can respond automatically to “What’s your name?” with “My name is ___.” There is an automatic question/response going on here in which no translation is occurring. In fact, I’d say a large percentage of the people that learn this in school couldn’t even translate it into its component parts. Language often seems tied to context. I usually automatically start to think in Turkish when I think about my wife. I won’t even notice the switch. Karenne once posted that she starts thinking in Spanish whenever she gets in a taxi. These examples seem to indicate language is mapped onto situational contexts. The same goes for David’s comment. Myself, along with many people I’ve met, can often speak two languages but would be hard pressed to translate between them at times. There are many things I say in Turkish that I only later realize what the translation would be after seeing it translated in subtitles in a movie or something. I also have many students that can talk about religion in English in my classes but find themselves unable to have the same conversation in Turkish. For these reasons, I’d say “thinking in L2” does happen. I am most intrigued by the period of mental translation. It is certainly happening and I also wonder if this process simply becomes so fast we don’t notice it anymore or if the brain simply switches to a context-language response after a while. Personally, I can think of at least one interesting bit in my own interlanguage. I consistently refer to pants as plural in Turkish although they aren’t. I make this mistake constantly. However, I never goof up the words ozlemek (to miss someone you care about) and kacirmak (to miss something like a bus). I suspect it’s because I originally translated pants in my head as plural and was told it was singular later, but learned both words for the English miss through context rather than a dictionary. It’s certainly an interesting area that I hope we do find the answers to one day. However, drawing simply from my own experiences, I’ve seen much more improvement in classes where L1 is limited and students are encouraged to think in English, regardless of whether that happens or not, so it seems to be the better route at the moment. Guy Cook’s distinction between GT and TILT may be very helpful in helping to promote well-thought out and judicious use of translation activities in order to promote language learning and awareness of similarities and differences between languages and cultures. As a CELTA trainer, I would defend the lack of L1 use on many different levels (teachers need to be prepared for multi-lingual classrooms, for a start) but we certainly don’t dogmatically dismiss its use or deny its advantages. TILT is just much better explored in-training within that mono-lingual environment and how it is used will always depend to some extent on the teacher’s ability in the L1 and so perhaps personal exploration of TILT activites is the way forward. I also wonder which is easier – to prepare efficient CCQs in English or ensure that a direct translation into L1 is actually accurate? Personally, I find the former much quicker and more accurate and I speak Spanish pretty well. After all, teachers who insist that conditionals in Spanish and English ‘are the same’ do TILT a greater disservice than anyone who dismisses GT as a methodological dinosaur. Thanks, Neil, for that comment, and particularly for the reference to the CELTA (i.e. pre-service training), where I’d always assumed that translation was ‘out-of-bounds’ (it was in my day!). Certainly, a quick skim through five methodology texts I happen to have to hand (published between 1991 and 2005), and targeted at both pre-service and in-service training, show very few – and sometimes zero – references to translation. Where it is mentioned, it is usually in the context of vocabulary teaching and testing, and comes with a strong ‘health warning’. Interestingly, a course that prepares trainees for the Teaching Knowledge Test (TKT) – where one assumes the bulk of the users are non-native speaker teachers working in their ‘home’ contexts, and therefore well-equipped to use translation – doesn’t mention the t-word once. As for your point about conditionals, I take it! But whether or not conditionals are the same or different, surely it might be interesting to compare and contrast them? Thanks for the reply, Scott! While it is interesting to compare and contrast conditionals in different languages, I think it’s much more interesting and helpful to students at all levels to be comparing and contrasting the different uses of the modal verbs and the verb forms that make up the ‘conditionals’ in English. The mention of ‘thinking in the L2’ got me to thinking! When we say ‘think’ in the target language, don’t we really mean the condition where you don’t have to consciously think at all? When I use Spanish, I am not aware of ‘thinking’, however in Catalan, in which I am less confident, I know I have to stop and make decisions, trawl my memory for the right lexis or form and so on, which slows me down and makes me less fluent. At lower levels, learners have little choice but to use their L1 system as a reference, they cannot switch it off, nor should they have to. As the interlanguage develops, students can gradually ease off their dependence on their L1 as they gain the ability, albeit inaccurately, to express themselves successfully in the TL. So here’s my question; when we say ‘think’ in the target language, are we really referring to automaticity? And if this is the case, isn’t translation more useful at lower levels? I have only recently begun a DELTA course so it’s only now that I’m beginning to link up the methodologies with my own teaching practises. When asked in one of our first sessions what I thought of translations my instant reply was ‘inaccurate’. I’ve often used an analogy of firing an arrow at a bull’s eye and hitting the outside of the circle to illustrate to my students this point. At this session the trainer challenged my view and as she did I realised I’d just accepted it as fact, as I had been consistently told during my training and teaching to insist students only use English in the classroom. When I reflect back on my own language learning – I have to admit I am not fluent in any other languages but have studied a few European languages and lived abroad long enough to make one of them functional – I am immediately conscious that without being able to use English particularly at the start I’d probably wouldn’t have gotten past the stage of greetings. Recently I was teaching a monolingual German group and often I overheard a student ask a peer for a translation, where I could confirm that the translation was correct or offer an alternative. It seemed to make the students feel more at ease and give them a sense of confidence that they had a crutch to lean on as well as make the lesson more efficient. I agree that full immersion offers students a fantastic opportunity to provide deeper language learning. I know being forced to speak a language has worked for me but I think banning L1 outright from the classroom can be as limiting and counterproductive as some of the methods the original GT was accused of. Little did I imagine that when Gavin Dudeney asserted his preference for Grammar Translation that within a week I would be reading an article about it that forced me to rethink my attitude to it. I’m not a big one for dichotomies, believing them to arise when two camps sit down and engage in monologues with each other. As a result, I’d never really sat back to think about GT. If I’d been asked for my views, I would have said that I would prefer English to be the language of the classroom and that I would have dissuaded students from “resorting” to L1 during class time. I suspect that this was/is for the same reasons that you wouldn’t expect your driving instructor to turn up outside your front door astride a tandem. Using the TL in the classroom gives students much needed opportunities to develop their ability to think their way around moments of incomprehension (and I don’t mind WHICH language people think in) as well as creating an atmosphere where people are as committed to the TL as possible. The latter point makes me think that perhaps TL-only classrooms are in no small part due to a sense of mistrust of the learner – sort of, “If we let them say this little phrase in L1, before we know it, they’ll never speak another word of English.” In turn, this mistrust is, perhaps, tacit recognition of the fact that a great many students -perhaps the majority- feel (or are) obliged to sit in the class and learn a language that many of them will never really need to use. Undoubtedly, the mistrust is also a tacit recognition of the fact that people can’t be expected to use L1 efficiently in class if they’re not guided in doing so and there’s no intention in the field to provide such guidance. None of which is to say that the “other” languages are entirely verboten in my classroom. They sneak in from time to time. This article serves to highlight an interesting challenge for me – namely, are there ways that I could/should actively encourage them to slip in more frequently? Once again, Mr Thornbury, I am indebted to you. Thank you, Diarmuid, but you should really be indebted to Guy Cook, whose excellent book was the pretext to shoot down another ELT myth, i.e. that translation is bad pedagogy. Just listen to him in full flight: “The purpose of this book has been twofold. One aim has been to show the weakness of exclusively monolingual language teaching — that the reasons behind it are more commercial and political and scientific, that it is supported only by selective evidence and shaky reasoning, and that disregards learner and teacher needs. A second aim has been to show that translation has an important role to play in language learning — that it develops both language awareness and use, that it is pedagogically effective and educationally desirable, and that it answers student needs in the contemporary globalised and multicultural world” (p. 155). I recall my TEFL trainer (in Manchester, in the late 90s) responding to a question from a trainee about L1 and translation use in the classroom, and his response was like a ton of bricks… Never, never. Once you allow L1 into the classroom and learning approach, it is all downhill from there. The chances of your students using English will diminish. Etc. But it is so obvious that translation in particular is something that does happen a lot in the classroom (even if it is not always audible or obvious: i.e., with learners doing it in their own heads, trying not to feel/look guilty in the process). I have also noticed a growing tolerance and then embracing of the role of the L1 in TEFL contexts where the monolingual teacher gradually begins to learn more of the learners own language. As someone else pointed out above (I think), there seems to be a correlation between acceptance of L1 and translation on the one hand and bilingual ability of teachers on the other. So translation is clearly a part of what happens in a lot of classrooms, but at official training and methodology book level, it is avoided (at best) and generally written off (at worst). Last week with a class of very low level beginner students from a variety of countries, I stopped at one point and had them translate some of the new vocabulary I was presenting into their own languages, and then had them check and correct me on my ability to say those words and phrases in their L1s. They really sparked up and got very engaged with it, and I think students at low levels in particular really appreciate it when their L1s are allowed to be drawn on, but are also recognised as potentially valuable. It is always nice as a low level learner to see your teacher stumble over new words in YOUR language as well — helps to create some common ground, methinks! But the learners also enjoyed hearing translations into other students L1s, and trying them on for size. That gave me a sense of English being a mediating language more than THE (one and only) language in a group of learners from different countries and cultures, and I think that is a valuable perspective to consider. … the learners also enjoyed hearing translations into other students L1s, and trying them on for size. Yes, nice idea, Jason – I think this is all part of acknowledging the learners’ identities, as well as respecting their ‘home’ culture, by allowing them their L1 ‘voice’. In the middle east where I was working until recently, it was common for students (in incredibly multi-lingual and ethnic classes by the way) even at upper levels to still use the greeting “Salaam Aleikum”. These students obviously knew the English version, but preferred for whatever reason to use their L1. Obviously it was catching, as I started to do it too – which lead to discussions along the “should we use English?” line. My response was that it was obviously a projection of personality and identity that lead the speaker to use the L1 greeting, and I think this is the point of L1 in class. My feeling is that if a student feels that their L1 is valued, both as a knowledge and expression of themselves they are more likely to and able to slide that L1 personality into the L2. Scott, thanks for pointing out this book. It’s going right on my Christmas wish-list (god, how sad is that?) I loved Language Play Language Learning and have often used translation in class. In Straightforward we included the t-word in regular exercises in the workbook. Teachers seemed to always respond well. We had a similar thing in Global (how do you say in your language… but not through deliberate avoidance of the t-word). The problem is the cost involved in making all the different versions. Even for Spain you would need Gallego, Catalan, Basque to start with. As a homage to this post, I may do a six translation activities soon! Yes, perhaps I am a coursebook writer manqué, if you’ll permit a bit of code-switching! It’s true – the publishing challenge of producing separate language coursebooks are large but not insuperable. Given that many courses are ‘versioned’ for specific markets, there is already a precedent for this. And, as Cook says, “the revolution introduced into publishing by computers allows swift adjustment of electronically stored text and therefore permits greater diversity of materials without affecting profit margins” (p. 148). In my proposal, only a small part of the actual materials was translation-based: the vocab and grammar sections essentially, plus one or two practice exercises. All the skills work was monolingual, and hence would not need to be ‘versioned’. 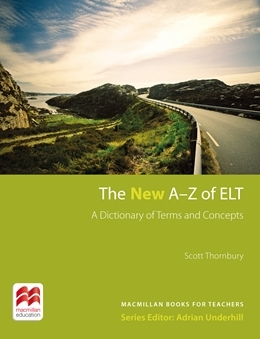 No less a coursebook than Headway (more recent editions) includes some elements of translation. Other coursebook writers, including myself, have followed suit. Feedback from teachers to the inclusion of (admittedly minimal) translation activities in Straightforward has been uniformly positive, so far as I am aware. Lindsay and I wrote a freebie ‘Guide to Translation and Dictation’ as a part of a series of teaching guides, and this proved to be the most popular of the series. It seems, as Guy Cook suggests, that the times they are a’changing. The times will have to change, Philip, to keep abreast of developing technologies. I was just talking to a friend, who teaches one-to-one business clients. A student of his who has minimal English has to compose emails in English at her workplace so my friend is training her how to use Google Translate for this purpose. Could this be the way things will go: English teaching will give way to translation training? I’ve always used students’ L1 (where possible and necessary) to help them understand. In my context you need it (English Kindergarten in Innsbruck, Austria). When children who start Kindergarten speak neither English nor German (the only two languages I know), I make an effort to learn at least a few basics in their language (even though I must admit I tend to forget them just as quickly). I enjoy learning bits of other languages from my students and it makes them feel good knowing they’d taught me something. If I can’t help them with the use of their L1, other students do. Maybe it would be wise if we learnt to learn again and not just to teach. Thanks, Rosie – “Maybe it would be wise if we learnt to learn again and not just to teach” – great point! Coincidentally (on the subject of bilingual classrooms), I received the latest catalogue from the publishers Multilingual Matters and there were at least two titles calling for a reassessment of classroom monolingualism. One is Code Choice in the Language Classroom, by Glenn Levine (not yet published) – you can read about it here. The other is First Language Use in Second and Foreign Language Learning, edited by Miles Turnbull and Jennifer Dailey-O’Cain, published in 2009. You can read about it here. Once again a comment that I posted to this blog appears to have gone astray. Or is this blog moderated and, as in Second Life, there is lag? ? If this ismessge is, in consequence, a repeat – please forgive me. Second time round, let me put it this way. German: English/Russian/Turkish/Spanish/Italian/Portuguese/. It is the practice in these schools to always have two teachers teaching together, one German-speaking and the other one a native speaker of the foreign target language. Each teacher sticks religiously to her (it is usually a woman) language. If a child asks a question in the foreign language lesson in German, the FL teacher routinely answers in the target language. So the children come to associate a particular language with a particular person and occasions. And these kids are good! They switch backwards and forwards between two languages with impressive ease, and translation, as an activity, simply does not take place. And I applaud that. I cannot escape the gut conviction that, when the focus is on learning, if you stick to one language you are effectively and efficiently muting inefficient, potentially inhibiting strategies in language learning, not allowing the learners to develop the disastrous habit of formulating first in the MT and then, albeit it silently, translating into the TL/FL. i.e. instead of striving for meaning using contextual clues, reaching for a dictionary (and perhaps finding the wrong translation) or lazily waiting for the moment when the teacher explains in the mother tongue. Good monolingual classes can possess a vibrant atmosphere, an attentiveness to and a striving after comprehension within one set of codes conducive to learning (acquisition) and use of the mother tongue jars, breaks a spell, legitimises bad acquisition habits. I love the idea of ‘breaking the spell’. A good language teacher can create a world the learners want to inhabit. This is difficult enough for parents to do. In order to maintain this FL-only atmosphere in a school environment, it is arguably easier if the teacher is a native speaker or has nativelike ability, which is not the case for the majority of FL teachers around the world. I think the situation above may be an ideal environment, one that should be aspired to (and is one of the basic tenets of the programme of language assistants and now CLIL) but for adult learners and for YLs who have 2-3 hours of FL instruction a week, with a teacher who may also teach them Geography in their native language, it may be harder to maintain. I could see the very same thing happening here. I’ve actually heard such comments from students. …are separate entities and I don’t think 3 and 4 would generate the some sort of “she doesn’t push us enough” perception. I teach at a university where there is a fairly complicated system of evaluation. And it is of the utmost importance that students understand that system. Were I not to explain such ‘meta-issues’ in Spanish, in an attempt to keep it all in L2, I would have no guarantee whatsoever that my upper-intermediate students had fully understand the rules. At times, too, I need students to understand the philosophy behind what I am doing or to speak to the group about issues such as the significance of English for their future. Once again, if I want to be sure that I am getting that message across and convincing students, I need to use Spanish. Essentially, I’m describing situations in which the message is more important than the language it is couched in; and don’t feel I have much of a choice here, though I know that once students have heard me speaking in fluent Spanish, they feel somehow that they have permission to speak to me in L1 about their meta-issues…and they do. Thanks, Luiz, for that neat breakdown of L1 uses and functions. It’s also worth re-iterating Alex’s point, earlier in the discussion, i.e. “we are actually conflating two totally distinct things – sensible use of L1 by the teacher and sensible use of L1 by the students.” Your points 3 and 4 would seem to map neatly on to those two distinctions. Absolutely. There are times when I would consider using L1 to ensure that the message is 101% ambiguity-free. Atkinson, D. (1987). The mother tongue in the classroom: A neglected resource? ELT Journal, 41(4): 241-247. Auerbach, E (1993) Reexamining English only in the ESL classroom. 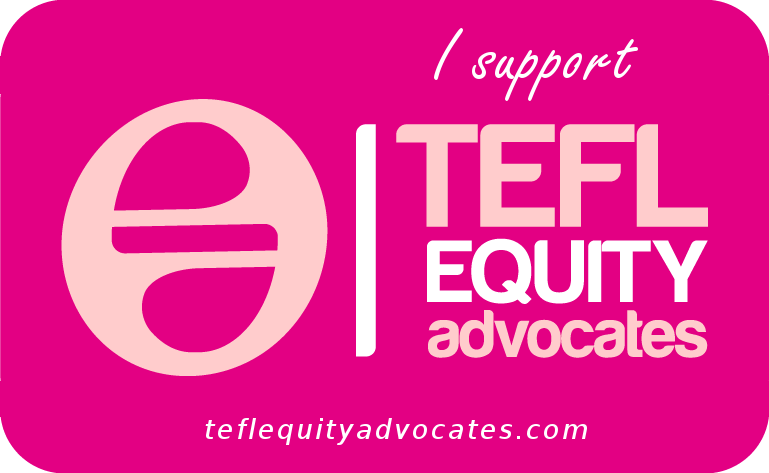 TESOL Quarterly, 27(1): 9-31. I think (but I may be mis-remembering!) that it was Rinvolucri who talked about the ‘ridiculous taboo’ of L1 use in the classroom, and it seems to me that the whole debate about who can use which languages and when is long overdue. Interestingly, in the UK further education system where I work, it was the ESOL teachers who were far more open to the idea of ‘allowing’ learners’ languages into the classroom that the EFL teachers, which I am sure is a legacy of pre-service training courses, materials etc. Oh yes and Phillipson’s Linguistic Imperialism is a good one for prompting thought about where this all began, too. I understand that totally. We all speak, in my case without always realising it, from the teaching experiences that have helped to mould our personal, subjective convictions – the context is primary. Precisely your argument was one that I fought ferociously for years at the unversity where I taught in Germany for years. Why? Because in our case we were training future teachers of English as a foreign language in primary schools, non-academic secondary schools and grammar schools. Our aim, as I saw it, was NOT to produce academics whose first allegiance was to the god of science “Wissenschaft”. That, almost without exception was the aim of my German colleagues who used to argue, for example, that you could not possibly expect students to study English literature in English, a foreign language, because they would miss all the nuances. So they went so far as to study English literature in German translation, to ensure that the students really understood what they were reading…… I am under time pressure as I write. Please Glennie do NOT take this posting as a criticism of your position in your circumstances. That is not the point I am trying to make. Anyone who’s learned a foreign language knows the value of translation. It’s just common sense. You have to translate things – to clarify the meaning of structures and words or to notice differences and similarities with your L1. I learned Spanish from a book called “An Essential Course in Modern Spanish” by H. Ramsden, a horrendous thing without a single picture. It’s 25 lessons of grammar explanations followed by a word list and then a bunch of translation exercises. When my then Spanish girlfriend announced one day she would never speak English to me again (I made the mistake of correcting her pronunciation one day – tsk!) I had to learn Spanish fast… or lose her. So we sat in the evenings and I translated and she corrected. (And we’re still together!) Translation was a vital part of my Spanish learning – though not the only way I learned, of course. And anyone who speaks a foreign language fluently knows there are words and expressions that you simply cannot translate – you just have to learn them as is. There are loads of Spanish words and expressions that I know how to use correctly but I have no idea what the equivalent is in English. And like Nick above there are words I use incorrectly in Spanish because of L1 interference. I still use plural verb forms with ‘la gente’ (people) even though ‘la gente’ is clearly singular. Doesn’t everyone learn to ‘build’ a knowledge of a second language by using their L1 as the foundation? Dare I say it Scott, it might need someone with your gravitas to get grammar translation back to where it belongs, as one of many effective methods of teaching a language. Bring it on! I’d love to know which part you disagree with, Dennis. Nevertheless, I’m glad to have raised such a passionate response. In Guy Cook’s book, he refers quite often to another book by Wolfgang Butzkamm & John A. W. Caldwell called ‘The Bilingual Reform’ (Tubingen, 2009). I’ve just read it. It’s a strongly argued case for the use of the mother tongue in the language classroom. Bucket-loads of good sense, well-referenced, and with no shortage of practical classroom suggestions. Thoroughly recommended. You are right, of course, about some contexts not lending themselves to the use of MT and translation techniques. We need to be very careful here. I remember some years ago when I worked in Bilbao how one colleague assumed he could use Spanish in class. Whilst everyone could understand Spanish, some Euskera speakers found this highly offensive. I’ll leave you to read Butzkamm & Caldwell’s arguments for yourself, and they do support their thesis with published research findings … but given the problems with classroom research (cf the on-going discussion about research on this blog), we can’t help being skeptical. I get the impression from this book that the authors are ‘pedagogically focussed practitioners than academic linguists and researchers’ … but they are both (now) university professors. Their focus is primarily on ‘normal’ state school contexts. In my interim period here between jobs I’ve picked up a night class. I was told by the school that this is an intermediate class and they have been studying for 4 and a half months. Easy peasy I thought. I walked into the class on the first day and students couldn’t even say where they lived properly. Turns out, they’d been learning in Turkish for the past 4 and a half months. We’re starting with the basics. Whenever I put something up on the board students begin to rattle off rules to me in L1. Ask them to make a sentence using those rules and they completely fall apart. The same goes for vocabulary. They can’t remember it. They have pages of translated vocab in their notes, but can’t recall any of it. Here I think is the key though. The other day we went through suggesting things such as “Let’s do something”, “How about doing something” “Why don’t we” etc. The students knew, remembered, and could use “let’s.” So I put it on the board then added an equals sign and put up the other two. I then double-checked to make sure the students understood the meaning was the same even though words and grammar were different. Half the class accepted it. The other half was completely lost. I heard frantic Turkish “What does about mean? How about? Like with car?” We then had major issues with “Why don’t we”. Eventually we got into giving suggestions and answering naturally, but half the class still kept trying to use “because” to answer the question even though there was a clear model of a question/answer structure on the board and I had modeled it repeatedly. Instead of looking at the language and how to use it or following my lead, they were translating and trying to make that fit. The more they translated, the more confused they became. There was actual resistance to processing the new language. This is what I’ve seen over and over again with reliance on translation and it’s what is really meant by L1 interference. Some students simply cannot wrap their heads around the idea that word-for-word translation doesn’t work. The more they think in L1, the more rigid their translation need and the more difficult it is for them to absorb new language properly. I once mentioned on my blog that when I do the dangers of translation lessons in my class there is always (seriously) at least one student that will get extremely upset and start fighting with me when I say that the answer to “How are you?” is not “Thanks.” Students not only have trouble thinking about an L2 as different from their L1, it very clearly throws up a huge obstacle at times. So, as I said in my comments above, the L1 can be used at times to structure the understanding of L2, but its use needs to be limited until a firm understanding (and more importantly belief in) the fact that the languages are not literally translatable is developed in the learners. I think this is one reason why L3 learning is so much easier than L2 learning as well. You simply don’t have those hang up on translation that you do when you first start learning an L2. I am sure I am basically in agreement with Nick and have , as I suspected would be the case, serious problems with Cook’s basic premise, though I won’t bore the readers of this blog with those at the momen. ( I have just started reading his book). Nick’s posting illustrates what happens when you regularly use two languages in a language classroom. “What about, what about…Could you also say…? ” [ and those questions typically in the mother tongue ]. The aim of the lesson, surely, is to use, practice, employ, acquire, learn, perform English. But if you regularly, as part of the routine process, permit the MT you remove the necessity of making the effort, overcoming the uncertainty, embarassment, strangeness of using the target language. There are useful comparisons to make this point clear, I think. Remember how in the bad old days of language laboratory drills one had to wean learners away from having the text to read from instead of training them to put their books face down so they could not read them and in listen attentively and repeat from memory? And for those of you that act or play music – how about comparing the use of translation (or not) with getting yourself away from having your script in your hand or your music on the music stand instead of speaking your part from or playing the tune from memory? The script is there, of course, is primary, as is the mother tongue or the written music, but to be a good performer – I believe and could not prove though would be happy to demonstrate – it is more effective to cut free from dependence on text, written music and mother tongue. Adam, I will gladly try to answer your question, but first could I post this link to a 15 minute video I have just come cross on Teachers TV. It is actually about teaching French grammar but I think participants in the present discussion might find it not uninteresting. The tiny url worked for me. Just click on the forward pointing arrow in the middle of the screen – with sound activated, of course. Sorry. tinyurls do not seem to work from comment areas so I must give you the full URL in all its ugliness to copy and paste into your browser. It seems to me that this hypothesis, by implication, lends at least some support to the practice of sticking to one language and avoiding whenever possible the use of the mother tongue in foreign language learning and teaching. Indeed, Dennis. Gal’s (1979) research of a bilingual community in Austria, close to the border with Hungary, highlighted the different roles that the two languages, German and Hungarian, played in the daily lives of its inhabitants. The research revealed much about attitudes, language shift, language choice, and the distinction of diglossic roles for each language, between high and low functions. It also shows us that if languages are used in different and specific ways then it is possible that some knowledge or means of expression are only available in one language, for a given bilingual speaker, because of the social patterns of use and roles that they are assigned. The main problem with the old GT approach was prescriptiveness. Rules distinguished right from wrong. Naturally this approach was more easily applied to written than to spoken work so the dead hand of GT was laid across all L2 teaching, and still is in rule oriented political cultures. Now that languages, and especially English, are seen to have many acceptable variants, rules are made to be broken and pragmatic communication matters, the necessary discipline of translation and the analytic value of grammar should have a good chance of re-birth in a more constructive style of L2 learning and acquisition.